We flew back home this week to spend a few days in our own town. I’m in a state of shock, all of a sudden realizing how much space we have. Here we could cook together while dancing, whereas in L.A. we are in a territorial-mode: I even growled at my beloved the other day because he insisted on opening the fridge while I did the dishes. The nerve! Cut the pork into thin slices 1/8 inch thick (against the grain). Cut each slice into ribbons, flattening them slightly with a meat mallet. In a large bowl, mix the soy sauce, rice wine, water, cornstarch, sugar and sesame oil until thoroughly blended, then add the pork slices and allow to marinade for 1-3 hours at room temperature or overnight in the fridge. Drain well before stir-frying. Cut the scallions into 2-inch pieces, trimming off the root ends. In a small bowl, mix the hoisin sauce, rice wine, soy, sugar, and sesame oil , stir well to dissolve everything. Add 2 T of peanut oil to a very hot wok, swirl to coat the pan, add the pork slices and stir fry until opaque. Add the sauce ingredients and continue cooking until the pork is cooked through, then add the scallions and reserve until the noodles are ready. Boil the noodles until cooked, but not mushy. Drain, then run through cold water until fully cooled. Shake off excess water and lay the cooked noodles over a dish cloth, blotting it out of excessive moisture. Transfer to a bowl, adding the sesame oil to coat the strands (the noodles can be kept cold at this stage for up to 2 days). Heat a 12 inch skillet over high heat, add 5 T oil, and heat until a strand of noodle sizzles if gently dropped on the pan. Coil the noodles evenly on the hot pan, starting at the edges, and working your way through the center. Press them with a spatula, cover the pan, then cook until the bottom is browned (5-7 minutes). 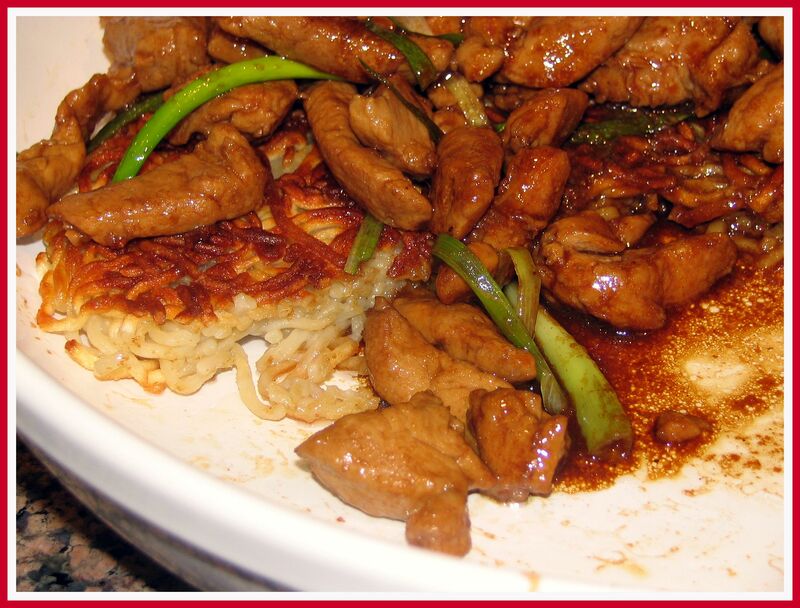 Loosen the browned noodles, slip them out of the pan, transfer to a serving platter. Mound the pork on top of the noodles, and serve immediately. Comments: Barbara’s original recipe calls for deep frying the pork before the final stir-fry. I have done this “oil velveting” in the past, but this time I simplified it and cooked the pork all the way through in the wok. The main reason: we are home for just a few days, I didn’t want to deal with the leftover oil. Is there a loss of quality in the final dish? In all honesty, yes. Velveting does wonders to improve the texture of stir-fries (as I mentioned before here), so if you can do it, follow her advice and deep fry the pork for a minute, remove it from the oil, drain it well, and add it to the wok AFTER you add the sauce and heat it up. Note to self: try the “water-velveting method” in this recipe. Lovely Asian style dish, the noodle s intriguing ! That looks like another recipe that I will have to try. I have the tomato bread cooling in the kitchen. Enjoy your space. Thanks, Tess… I will make sure to take your advice in consideration when I need to by sesame oil next time. Mine tend to last a long time, though…. I’ve velveted in water before but never in oil. I’ll have to try it some time. The browned noodles look delicious! Water velveting is definitely much easier to handle, I guess I’ll try it next time with pork, I’ve only used it for chicken.